NVIDIA introduced their flagship GK110 based GeForce GTX 780 Ti graphics card last month but new information suggests that there’s more GK110 action to come. New details from Videocardz points out to imminent releases of two new monstrous cards from NVIDIA, the GeForce GTX 790 and GeForce GTX Titan Black Edition. The rumored flagship launch of 2014 from NVIDIA would be the GeForce GTX 790 which will replace the GeForce GTX 690 boasting dual-GK110 cores compared to dual-GK104 cores on its predecessor. The GeForce GTX 790 will feature two GK110 cores with 4992 Cuda Cores, 416 TMUs and 80 ROPs. This mean that the GeForce GTX 790 is not featuring the full GK110 specifications and rather cut-down with 2496 Cores, 208 TMUs and 40 ROPs. Other specs include a 320-bit x 2 interface compared to the 384-bit found on the rest of the GK110 based products and has a 10 GB GDDR5 memory. That’s 5 GB of GDDR5 memory for each chip which is a plus compared to the 3 GB memory found on NVIDIA’s entire high-performance lineup. The GeForce GTX 790 is expected to launch in March 2014 and will cost around $1000 US which is similar to past dual-chip based graphics card’s pricing structure from NVIDIA and AMD. Clock frequencies are not know but we will be looking at moderate frequencies since NVIDIA will tone down the power consumption around the 300W barrier since they have put a high emphasis on their graphics cards quality in terms of temperatures, acoustics, design and performance. Ofcourse, this isn’t confirmed information and we might not even see a dual-chip launch from NVIDIA based on GK110 cores but hope for the best. 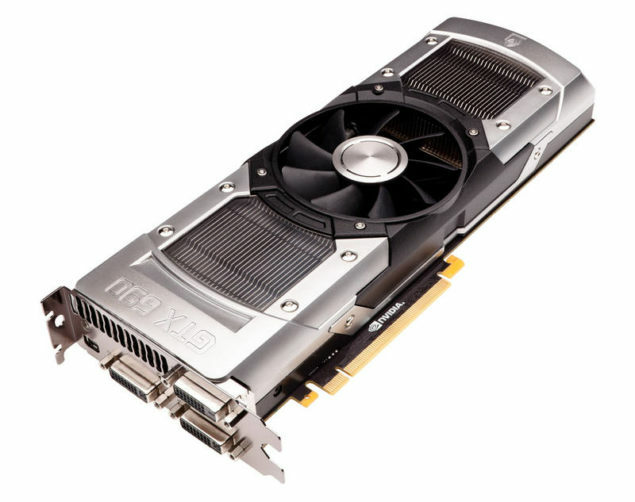 NVIDIA GeForce GTX Titan Black Edition 6 GB – Titan Returns With Fury? The second product NVIDIA plans to launch is the GeForce GTX Titan Black Edition which from the name suggests a TItan refresh. NVIDIA’s GeForce GTX TItan was the first graphics card to feature the GK110 core which boasted 2668 Cuda Cores. The card was all-around perfect from its design to performance but the price wasn’t attractive and the card became insignificant after the launch of the GeForce GTX 780 and GeForce GTX 780 Ti. The GeForce GTX Titan Black Edition will be a new GK110 based card featuring the full specifications of the core with 2880 Cuda cores, 240 TMUs and 48 ROPs. The card will probably be the first NVIDIA GPU to feature a 6 GB memory running along a 384-bit interface. This could mean that NVIDIA won’t launch a 6 GB variant of the GTX 780 Ti in the near future or this could be wrong considering this is a rumor. There were details passed on to us recently that NVIDIA was trying to clear inventory of their GeForce GTX Titan to pave way for the new 6 GB SKU and it seems true now. Clock frequencies are not know but the GeForce GTX Titan will feature a TDP of 250W and will come with a black colored Titan NVTTM cooler like the one featured on the GeForce GTX 770/780/780 Ti. The cooler still looks great regardless of the fact that NVIDIA’s entire 2014 video card lineup has used it (except the GTX 760). The card, just like its predecessor would feature a price of $999 US.